The French word for “sword,” épée (pronounced “EPP-pay”) is the descendant of the dueling sword. The modern épée is heavier than a foil, weighing approximately 27 ounces, and features a stiffer, thicker blade and a larger guard. As in foil, touches are scored only with the point of the blade. What makes épée so different from foil however, is that in épée the entire body, head-to-toe, is a valid target — just like in an actual duel. Similar to the foil, the point of the épée is fixed with a blunt, spring-loaded button. However, the épée tip requires greater than 750 grams of pressure to register a touch with the scoring machine. Basically this means that épée fencers have to hit harder. 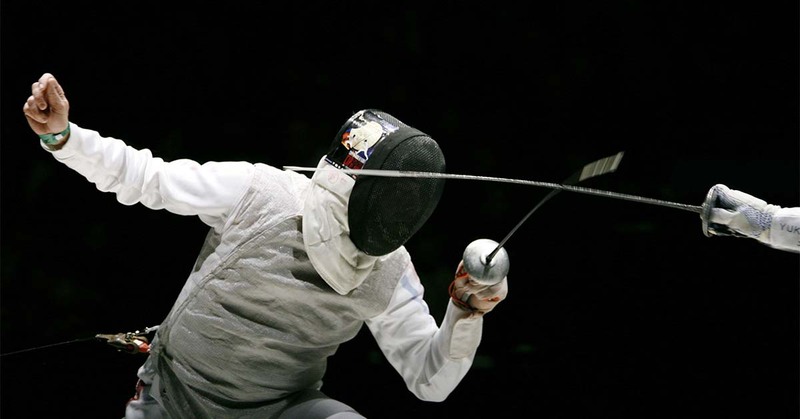 Because the entire body is a valid target area, épée fencers do not have to wear a metallic lamé. The first Olympics to feature team and individual Women’s Épée events were the 1996 games in Atlanta. We are ready to teach your children how to épée fence at Lilov Fencing Academy in Cedar Grove. Our coaches are some of the best in the world and they can help your kids learn an exciting new sport that can take them far. Contact us today.